Horseback rides operated from Helmcken Falls Lodge are by Battle Mountain Equine Enterprises Inc & is a separate entity from Helmcken Falls Lodge. Battle Mountain Equine Enterprises Inc is lucky to be one of the few that can take guided trail rides into Wells Gray Provincial Park. Join their knowledgeable, friendly & helpful guides on an informative ride through the park - Make sure you have your camera to the ready as you never know what you may see on your travels. 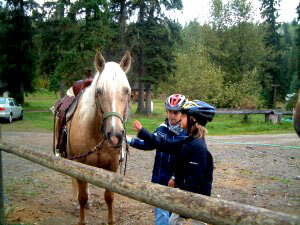 Trail rides available vary from 2 hours - All day rides & overnight trips for the more adventurous traveler & all rides take in various areas of the park. This includes Hemp creek, Smith Lake & the Bee Farm. For more information, details, pricing & bookings please contact Battle Mountain Equine Enterprises. 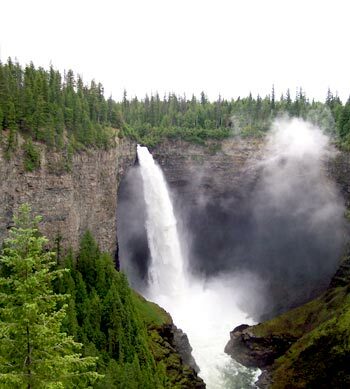 There are many hiking trails to explore whilst here in Wells Gray Provincial Park. Trails do differ & there are some for all fitness levels. So do speak to our friendly & knowledgable staff who will advise you on the best trails & sights to see whilst you are here. Some highlights of trails & sights to see are listed below. This is the 4th Largest waterfall in Canada & is a must see for everyone! You will be in awe when you see this spectacular falls. With a big parking area it is just a 2 minute walk to the viewing platform, this is a 15 minute drive from the Lodge. Fantastic photo opportunity - you will not be disappointed with what you see!! This trail is 10km return & gives you a different up close view of the falls, a spectacular view point & photo opportunity. There are no safety fences on this trail so be very careful with young children hiking with you! 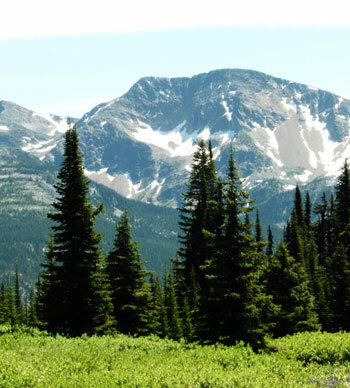 These meadows are sub-alpine meadows & one of the easiest to access in BC. In late June early July they are abundant with glacier Lilies blooming, in early August the same meadows are full of vibrant colours when the mountain Daisy, Indian Paintbrush, arctic Lupine & other flowers bloom! Drive 4km up this road & you will see the Green Mountain Viewing tower with fantastic views along the Valley & information boards on the mountains that you can see. You can also access the Foot Lake & White Horse Bluffs Trails from here. This is a 32km loop & is ideal for those that like a good days hiking or mountain biking. This trail starts at the Warming Hut at the entrance to Wells Gray Provincial Park. This is a must see whatever time of the year you are here. This is a cool hike through old growth forest. 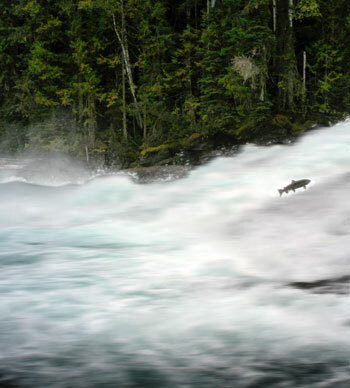 In late August & early September watch the Salmon Leaping from the river - this is an amazing sight to experience!! If you prefer to have a guide with you when you go to see the sights on Clearwater Lake then this is an ideal trip, its a great trip for those that have never been canoeing but wish to try a canoe trip. Your guide will take you for a hike once you reach Eagle Point Lake. All safety equipment is provided & the guide will inform you of the history as you paddle up the Lake. 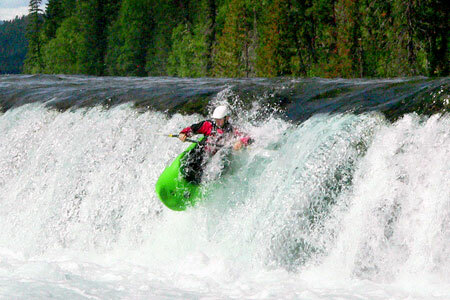 For more information & prices please see www.clearwaterlaketours.com. With an arrangement of tours available you will not be disappointed, from full day trips to 1 hour specials, all can be catered for. A full day trip will take in the sights of Clearwater Lake & Azure Lake. You will travel up the lake to Rainbow Falls. 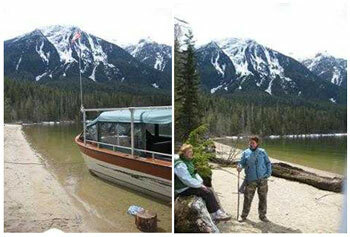 This trip includes lunch on the beach at Azure Lake, a hike to Rainbow Falls (optional) & canoeing. If a full day is not your thing or you just want a taster then why not do a 1 hour trip on the Electric Duffy Boat, this departs twice a day. 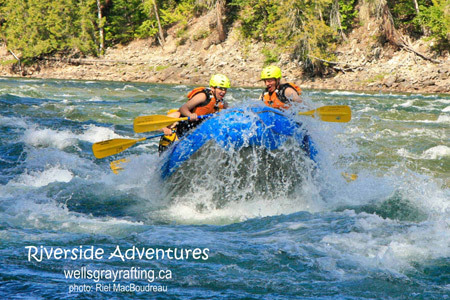 Further information on these trips & more can be found at www.clearwaterlaketours.com. 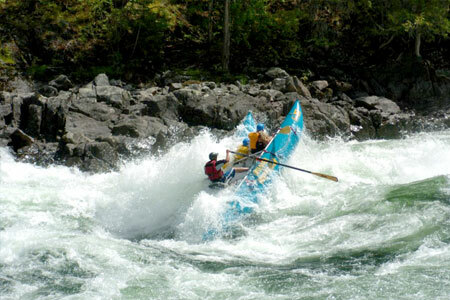 River Rafting: Offered by three Companies in Clearwater! 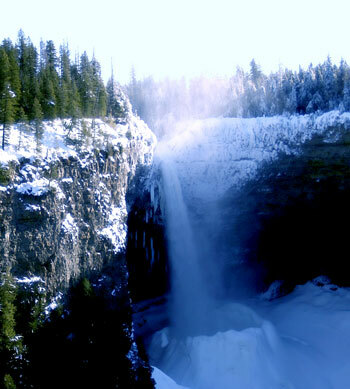 Experience the splendor of Wells Gray Provincial Park & Helmcken Falls in the winter!! 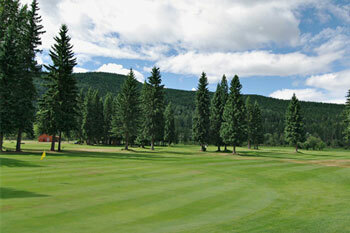 Perfect for cross country skiing, snowshoeing & sledding nearby or just to relax & unwind. Come on your own or with a group of friends - either way you will have so much fun! Winter Trail Fee usage is $5.00 per person per day on Maintained trails. Helmcken Falls is a Must see in the winter!! Marvel at the breathtaking Ice Cone that forms through the winter months. You will not be disappointed with what you see!! Green Mountain Viewing Tower has some fantastic views. Why not ski the newer trail added in 2010 that was added up on Green Mountain. This is the fastest growing sport in Canada & we have perfect location to explore for both beginners & seasonal snow shoers alike. Speak to the Lodge staff & we will find a trail to fit your skills & fitness level to ensure that you have a wonderful experience! Our ski trails are groomed so there are over 50km of wonderful packed trails for you to enjoy. If you are a little more adventurous the Helmcken Falls Rim Trail is a spectacular 10km round trip of about 3 hours depending on your skill & fitness levels. There are many hiking trails perfectly suited for snow shoeing in the winter, lots of which have great opportunities for seeing moose, deer, owls, martins, hawks & woodpeckers. So make sure you have your camera to hand!! 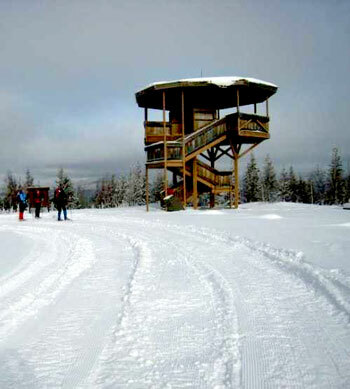 We have over 50km of cross country ski trails for the perfect winter skiing experience in Wells Gray Provincial Park. You can ski right from the Lodge on to our ski trails!! The Blackwater & Stillwater trails stretch out along the Murtle River & past Pyramid Mountain & return to Helmcken Falls Lodge. These trails total 35km & can be enjoyed by novices & advanced skiers. These trails are groomed & track set for classic skiing. The Green mountain trail was opened up in 2010 for intermediate & above skiers. The Trail starts with a 4km uphill ski but is then followed by 14km of beautiful trail with a predominate downhill gradient. The last 3km is a real downhill thrill along the Green Mountain access road returning to the start point after an 18.1km ski loop. 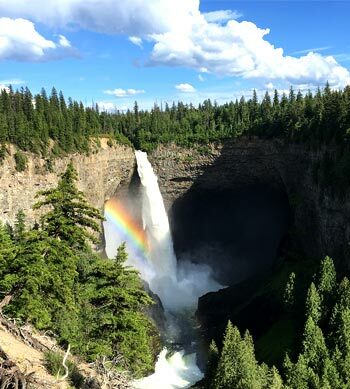 Having achieved the first 4km you are rewarded with breathtaking views of Wells Gray from the purpose built wooden viewing tower. After this splendid photo opportunity you ski 5.8km past Foot Lake & out to the West side of Green Mountain. Here you get a 270 degree view of the Clearwater River valley from an amazing cliff edge vantage point, this is a wonderful spot for a packed lunch! You will then proceed north along the West Tote trail, connecting after 5km with the Green Mountain Access road for the thrilling downhill finale!!! This trail is groomed but not track set, so it is ideal for classic & skate skiing. We also have an abundance of back country skiing available on our large network of summer hiking trails, many of which are easily accessible in the winter. Tell us your skill level & we will ensure you take the trails that give you the most enjoyment for your abilities. perfect photo opportunities Winter & Summer!! !